The first weekend of the 2014 football season is in the books. And our tigers are undefeated. War Eagle! It is a little scary playing an SEC game right out of the gates, but the boys handled those Arkansas piggies, I mean razorbacks, just fine (minus some second quarter woes). We watched the first half of the game from a Taco Mac in Atlanta while feasting on queso (lots and lots of queso due to a waitress mishap) and wings. Alabama was playing their game in Atlanta so there was an abnormal number of bama fans around us, but they mostly just yelled amongst themselves and left us alone. 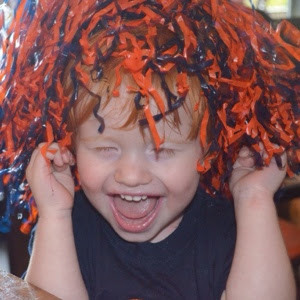 Having the world's cutest little tiger fan probably helped our cause. 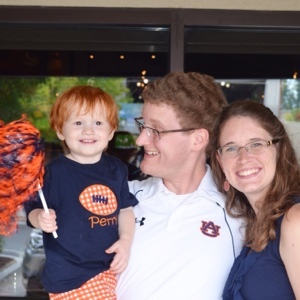 Love that picture of my Auburn family. At halftime we went back to Kristen's apartment to watch the rest of the game. Wound up being a good call because the game had an hour and a half lightning delay during the 4th quarter. 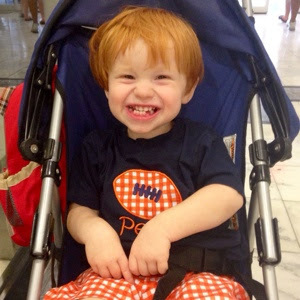 Perry was looking cute all day Saturday sporting his orange and blue football outfit. Auburn wound up winning the game 45-21. Next up is San Jose State next weekend. We will be hanging with friends and tailgating at home. We have sworn off attending games until it gets cooler outside. It is so nice to have football back on the weekend agenda. Fall is finally in the air (figuratively at least considering the highs are still holding steady in the 90s). War Eagle! We are 1-0!